The poetry of Hungarian writer György (George) Faludy is not only powerful and memorable, it is also exciting. Faludy (1910-2006) lived through the nightmares of both World War II and communism (he left Hungary after the tragic failure of the 1956 uprising) and he brings to everything he writes a certain intimacy with life and death that luckier people will never know. He arrives bearing news of a truth that burns deep in our bones—that mankind is not benign, that suffering is meaningless, and that love, like death, is inevitable. He might be speaking of his own poetry when he writes, “this land can be frighteningly cruel, but its plain face cannot tell a lie.” Especially harrowing are his poems about his time in the “Hungarian gulag”. He was a visionary man of letters with near god-like status in his native Hungary. He belongs on the same shelf as Paul Celan, Czeslaw Milosz, Zbigniew Herbert, Yehuda Amichai, and Tomas Tranströmer. And his decades-long translator, Paul Sohar, has evidently made this book a labor of love, for he has translated Faludy’s Hungarian rhymes and rhythms into English rhymes and rhythms. Today, rhymed peotry too often sounds like an affectation or an anachronism. 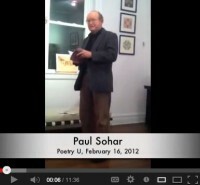 But Sohar writes in clear, straightforward lines—the rhymes are unforced, the rhythm is varied. He’s set the bar higher for all future translators of world poetry. AHF featured member Paul Sohar made his way as a young student refugee from Hungary to the US where he abandoned his formal education with a BA degree in philosophy with chemistry as his minor. The latter subject turned out to be the basis of his daytime job with a drug company while he hoped to pursue his literary interests. He briefly served as the poetry editor of an incipient publication “Reject” that later changed itself to a much tamer “Literary Forum”. However, the practical side of writing did not suit Sohar’s temperament, and from then on he published his prose and poetry only sporadically until he was commissioned to translate contemporary Hungarian poetry. He enjoyed the challenge of writing vicariously and the opportunity to explore various styles standing behind a recognized poet. In his naiveté he assumed that somebody else would see his translations through publication, but he soon learned that translation was not an ivory tower job either, and he had to go knocking on the doors of editorial offices to peddle his work. But at least it was much less embarrassing than touting his own stuff. It was a mission, the promotion of Hungarian culture in the English-Speaking World, and he approached it with much less diffidence and defensiveness. The resulting anthology "Maradok-I Remain" (Pro-Print, Romania,1997), focused on ten Transylvanian-Hungarian poets in a bilingual edition. The response of editors was very encouraging (from Kenyon Review, Partisan Review, Seneca Review, etc), but their clear favorite was Sándor Kányádi. From then on Sohar had no choice but to use the latter poet to spearhead his campaign of bringing contemporary Hungarian poetry to the English-speaking public. His first collection of Kányádi poems, "Dancing Embers", was published by Twisted Spoon Press, an American publisher operating in Prague (2002). The second one, "In Contemporary Tense" is now in print, scheduled to come out this June in Romania (Irodelmi Jelen) and here in the US (Iniquity Press). Both books bear an indisputable stamp of quality: an extensive list of acknowledgements, publications where the translations first appeared. Since the only excuse Sohar had for translating poetry was that he claimed to be a poet himself, he felt it incumbent upon him to prove his qualification: he had to get his own creations into print more extensively, however belatedly, building up more than 200 publication credits in the past 10 years (Agni, Chiron, Gargoyle, Rattle, Rhino, Sanskrit, etc). And finally he published a volume of his own poetry as well (“Homing Poems”, Iniquity Press, 2005). This was quickly followed by a prose work: “True Tales of a Fictitious Spy”, creative nonfiction about the Stalinist gulag system in Hungary based on the short stories of Ferenc Aladár Györgyey. His stage credits include a short drama ("Renewal") now coming out in Canada from One Act Depot and a musical "G-d Is Something Gorgeous", produced in Scranton PA in 2007; he wrote the lyrics and collaborated on the book. He also contributes to Magyar Napló in Hungary by selecting American poets for translation and writing the introduction to each collection. He often lectures at MLA and AHEA conferences. In 2011 he was the winner of Wordrunner Press prize that resulted in a book: "The Wayward Orchard", more of his own poetry. He was rewarded with a first prize by the Lincoln Poets in California in 2012. In addition he is the translator of Zoltán Böszörményi's Hungarian bestseller novels; the first one "Far from Nothing" was published in Toronto in 2006, and the second, "The Club at Eddy's Bar" is scheduled to come out in Dublin from Pheaton Press in June of this year. January 2013 saw the publication of a collection of Faludy poems in his translation: "Silver Pirouettes" by The Write Deal publisher as an e-book. Many of the poems have been published in such prestigious journals in the UK (Stand), Canada (Descant), and the US (International Poetry Review, Bitter Oleander, etc). In cooperation with his publisher he is in the process of setting up readings from that book in the NYC area, the first stop being Magyar Ház. He is open to invitations. The book is available for downloading at a small fee on www.thewritedeal.org. György Faludy is now one of the classics of 20th century Hungarian literature. He was born and died in Budapest (1910-2006) but spent most of his life in exile. In 1939 as a socialist and a Jew, he first fled to Paris, then North Africa, and finally he served in the US Army. After the war he went back to liberated Hungary, but the Soviet-installed government put him in a deadly forced-labor camp. He escaped Hungary again during the 1956 Revolution to the West, first to London and then to Toronto, and didn't go back again until the 1990 regime change. We are all volunteer and need your support! Join online!